Tucy wrote: And in reality, it would take a lot more than 11,000 units. 1.75 occupants per unit is very unlikely to ever happen. 1.4 is more likely, at full occupancy. 20,000 people at 1.4 per unit requires more than 14,000 new units. That's crazy talk. Doesn't even pass the giggle test. Seems like they mean 20,000 in five years up from 11,000, not 11+20=31,000.... but whatever. With what's going right now we could add 30% more residents, so there's a lot to do. To follow along as a North Texas sub-market receives 10,000 new units within five years is not outrageous, the perimeter of the population center has experienced population/inventory growth like this for decades... maybe we're just surprised because it is anticipated to happen in the middle of town. I've been looking forward to this since the CityPlace West Village TIF was approved. Fifteen years for everything to take root, 15 years for everything to really become established, it's about time. Dallas will be a "Place" in a few more years, finally. tamtagon wrote: Fifteen years for everything to take root, 15 years for everything to really become established, it's about time. Dallas will be a "Place" in a few more years, finally. True, but I think a better way to phrase that would be Dallas will be a place AGAIN in a few more years. The urban core was a thriving "place" before the freeways, white flight, and general neighborhood destruction of the 70s/80s. I found it on Page 3 of the Report. I'm pretty sure we're victims of journalism malpractice. The slide says "50,000+ residents within 2.5 miles". I take that to mean there are currently more than 50,000 residents within 2.5 miles of the CBD. It also says "20,000+ more residents next 2-5 years". I take that to mean they project more than 20,000 additional residents within 2.5 miles of the CBD in the next 2-5 years. That is a rational (although still aggressive, especially the 2-year side) projection. The slide could have been presented more clearly, but that is the only rational interpretation. ^ya, the loosy-goosy reporting goes with the news-entertainment format infesting just about every network affiliate local news time slot. So, the five year estimate looks for about 10,000 new residents a year in the Greater Downtown Dallas Area.... that data does follow the trend of the past decade, and considering contemporary housing complexes hold twice or a little more residents than the two-generation garden apartments currently being replaced, 10,000 a year sounds aggressive because we're not used to it happening. I hope those folks rewiring the downtown area bus system are out in front of this. tamtagon wrote: I hope those folks rewiring the downtown area bus system are out in front of this. I don't think they know what buses are yet. The slide says "50,000+ residents within 2.5 miles". I think the circular graphic represents the population area they are referring to. It includes portions of the Design District, Riverfront District, Oak Cliff, The Cedars, Downtown, South Dallas/Fair Park, and Old East Dallas. That's an area of 19 sq miles if I got my math right (2.5mile radius) so 50,000 in 19 sq miles is 2500 people per sq mile. 70,000 in 19 sq miles is about 3500 per sq mile. tamtagon wrote: ^ So, the five year estimate looks for about 10,000 new residents a year in the Greater Downtown Dallas Area.... that data does follow the trend of the past decade, and considering contemporary housing complexes hold twice or a little more residents than the two-generation garden apartments currently being replaced, 10,000 a year sounds aggressive because we're not used to it happening. I guess at the high end you could say they are looking for about 10,000 new residents a year in the Greater Downtown area (20,000 in 2-5 years). At the "low" end, it would be more like 4,000 per year. Even the low end seems ambitious. According to the report, Greater Downtown has grown by about 30,000 people in the 12 years 2004-2016. That was about 2,500 new residents per year. So they are looking for 60-400% faster growth over the next 5 years than we experienced in the previous 12? On what basis did they make such a forecast? Indeed we are not used to seeing 10,000 per year growth in our greater downtown area, and I don't expect we'll have any reason to get used to such aggressive growth either. I'm genuinely curious on what basis they made those growth projections. Last edited by Tucy on 19 May 2018 10:02, edited 1 time in total. If you haven't read the updated plan yet, there's some good stuff for anyone paying attention starting ~pg 50. -shows orientation of future perot museum building. -orientation of South Asian museum and highrise. "Design dart train portal to facilitate development over it." -redevelopment of east transfer center. It seems overly ambitious, but the team in charge of the 360 plan managed to beat their own projections of 10k in the loop and 50k in greater downtown, and has completed a respectable number of projects and goals, so I guess we'll see. Tucy wrote: The report tells us that Greater Downtown grew by 169.5% between in the 12 years According to the report, Greater Downtown has grown by about 30,000 people in the 12 years 2004-2016. That was about 2,500 new residents per year. So they are looking for 60-400% faster growth over the next 5 years than we experienced in the previous 12? On what basis did they make such a forecast? I totally agree with your sentiment about the prediction being extremely ambitious. However, I'm curious to know what the growth breakdown is per year for the past 12 years. Specifically, I wonder what growth has been like for the past 2-3 years. Again, I'm not really agreeing with their predictions, but, I'm just curious to know how the 4,000 per year compares to the last 2-3 years. ...The report tells us that Greater Downtown grew by 169.5% between in the 12 years According to the report, Greater Downtown has grown by about 30,000 people in the 12 years 2004-2016. That was about 2,500 new residents per year. So they are looking for 60-400% faster growth over the next 5 years than we experienced in the previous 12? On what basis did they make such a forecast? I didn't read the report, maybe the basis of the forecast is included. Among North Texas housing submarkets entering a stage of rapid growth, it's common to see such very high rate-of-change %. The recession slowed housing inventory growth, so maybe the next five years will make up for it. Until people stop wanting to live packed into the city, the population growth trend of the past decade will continue. Now, look at it this way: the CBD population change from 2000 to ~2010 was up and astonishing 2,500% and the change from 2000 to 2017 is an even more astonishing 5,500%!!! WOW With percentages like that, 60-400% is peanuts. As Downtown Dallas Inc. nears its 60th anniversary, DDI remains committed to speaking for "today and tomorrow, rather than yesterday." Headlines of the decade read of 7 million square feet of new office space added to the skyline, only to be beat by New York, and openings of projects like Dallas Memorial Auditorium, The Statler Hilton and Old Dallas Library, the Dallas Federal Savings and Loan Building, Southland LIFE Insurance Tower, Titche-Goettinger expansion, Republic National Bank Building, The Downtown Merchandise Mart, and many more. Economic development efforts in the city center continue at a rapid pace. Within downtown and the geography addressed in The 360 Plan (which comprises approximately a 2.5-mile radius from downtown), there were more than 6,500 residential units under construction and another 5,000 announced last year, surpassing 70,000 residents in the city center. Startups and entrepreneurs continue to call downtown Dallas home, proven by over 20 co-working spaces totaling over 400,000 square feet of space. And with plenty to do at 55 more restaurants, bars and hotels that opened last year, there is never a dull moment in Downtown. Downtown even celebrated announcements related to not one, but three, grocery/bodega stores, Commissary (now open) on Main Street and two Royal Blue Grocery locations (coming soon). These are in addition to the thriving Dallas Farmers Market, and Kroger and Tom Thumb announcements in neighborhoods closely connected to Downtown. Four new parks are underway, thanks to the Parks for Downtown Dallas Foundation and funding approved in the 2017 bond. This will add eight acres of much needed greenspace to our neighborhood. Downtown Dallas is coming into its own through residential development, infill remodels and city initiatives. Experts say they have seen Downtown morph over the last decade from a vacant place to a viable and (almost) vibrant place. “Ten years ago, we wouldn’t have been having this conversation. We didn’t have the choice of lifestyle to live [in] this urban environment in Dallas. It just didn’t exist, and so it’s so cool, from a market maturity standpoint, watching little Dallas grow to a level that now you have a choice,” JLL President, South-Central Region Brad Selner said at Bisnow’s Future of Downtown event. Here are two things that are pushing Downtown toward the global stage and one that is holding it back. There are 11,000 people living within the loop of Downtown, Downtown Inc. CEO Kourtny Garrett said. Open the compass to encircle the 2 miles surrounding the Downtown core and there are 70,000 people living in the area. According to her, this was not the case until recently. “Twenty years ago, we had 40 vacant buildings in Downtown … now, our vacant buildings sit at zero thanks to Statler, Drever and Dallas High School,' which were our last three. The next evolution is infill,” Garrett said. The push for infill remodels has breathed new life into Downtown Dallas. These projects are creating buzz and potential for formerly unused old product, and bit by bit, changing Downtown’s image for the better. Experts point to a lack of Downtown schools and a lack of faith in DISD as an integral reason Downtown Dallas is struggling to change its image at the national level. Corgan associate principal Matt McDonald asked audience members at the event to raise their hands if they had children and lived in DISD. Many of them raised their hands but when McDonald asked how many of them enrolled their children in DISD, all but a handful of people lowered their hands. “You can tell right there. That’s the issue I think is what we’re seeing. As a proud DISD parent myself, we’re seeing that parental participation and that kind of thing is the key factor,” McDonald said. Just curious to know what the tallest vacant building (after 1401 Elm) is downtown. I can only think of one, and that's 505 N Ervay owned by First Baptist. Shame that they're allowed to just hold that property when it could be generating tax revenue. lakewoodhobo wrote: Just curious to know what the tallest vacant building (after 1401 Elm) is downtown. I can only think of one, and that's 505 N Ervay owned by First Baptist. Shame that they're allowed to just hold that property when it could be generating tax revenue. That probably is the tallest vacant building. Will it remain vacant until First Baptist decides to demolish it some day? With all those windows it could make a nice apartment conversion. Hard to believe there aren't many vacant buildings left, when just a few years ago there was a full list. Every time I walk past this building I imagine it as apartments. Even though this area of downtown is pretty built up, it's still really quiet. Apartments there with retail at the bottom would be pretty cool. Its been under construction or in limbo for so long it's almost hard to imagine being finished, still a long ways to go too but hopefully once it's open for business it will have been worth the wait. mdg109 wrote: Every time I walk past this building I imagine it as apartments. Even though this area of downtown is pretty built up, it's still really quiet. Apartments there with retail at the bottom would be pretty cool. I agree. It actually looks like a sibling of Corrigan Tower, and I believe I've seen renderings of this building imagined as residential somewhere. This would make a great free medical clinic and community service 'helping hand' facility, possibly with transitional housing. I’m glad to see others have imagined 505 Ervay as an apartment building. I walk past this building every morning and evening on my way to and from work and dream of it being activated. I imagine First Baptist has no such plans for it, though. Actually... with the Holocaust Museum getting started, maybe the congregation owning this building will be led to open a civil rights Alt-Museum -- highlighting generations of efforts from the KKK, Pro-Life Movement, Religious Freedom, and other Politico-Biblical reactions. Progressives have shaken up society many times over the years as the human rights violations of various minority groups have been exposed. Why not have an Alt-Museum focusing on the leaders and movements resisting the progressives? There could be an entire floor dedicated to life and ministry of Dr. Criswell (except the part about allowing abortion), and why not go ahead and get some sort of installation for Dr. Jeffers? The thread though remains for downtown Dallas’ progress, not its regress. File that idea in our Opolis Blueprints subforum under “DeplorabLouvre,” if you’d like. Is this the same red brick building that says "Dallas County Criminal Courts" on it? What is going on there? A refurbishment was announced 3 years ago but so many windows are broken and it looks abandoned. It's a beautiful building and should not be so neglected. According to the linkies, there is still ~3 years of work left to do in the Records Building renovation. They're trying to make 1 whole building from 3 separate ones, so it sounds a bit complicated. For all the progress made, we have more vacant land (86 acres) than any other CBD in the nation. Not surprising when you look at the Spire acreage, Reunion district, land around Fountain Place and all the parking lots in-between, but still. Now that we're almost done repurposing old buildings, imagine what the skyline will look like with another 10 towers. "The least dense CBD in Texas, as well as on our 25-city list, is Dallas, with vacant lots in the urban core adding up to 86 acres." What are density / pop. For each CBD? I wonder what their definition of CBD is. Last edited by Tivo_Kenevil on 17 May 2018 16:34, edited 1 time in total. ROFL That reads almost like The Onion. The study finds that Dallas still has more vacant land than any other downtown and Steve Brown reports it as having the most room to grow. Way to make lemonade out of lemons Steve! I would have viewed that report as a reason why downtown will remain "less expensive" and may make Dallas a more attractive market for the foreseeable future. Having such a vacant Downtown isn't really something to brag about. However, I guess if you take into account that it's so empty AND it is one of the fastest growing markets in the country, then it could be seen as a positive sign. It's not like Downtown is vacant and declining. Tivo_Kenevil wrote: I wonder what their definition of CBD is. Yeah, I'm wondering that too, because I'm shocked to see Austin so high on that list. LOL Houston should be at the very top of the list. It has block, after block, after block, after more blocks of parking lots followed by some blocks of straight up empty land that not even parking lots cover...... I call BS on this data. I wonder where all that empty acreage is in New York City. I have rarely ever seen an empty space there. 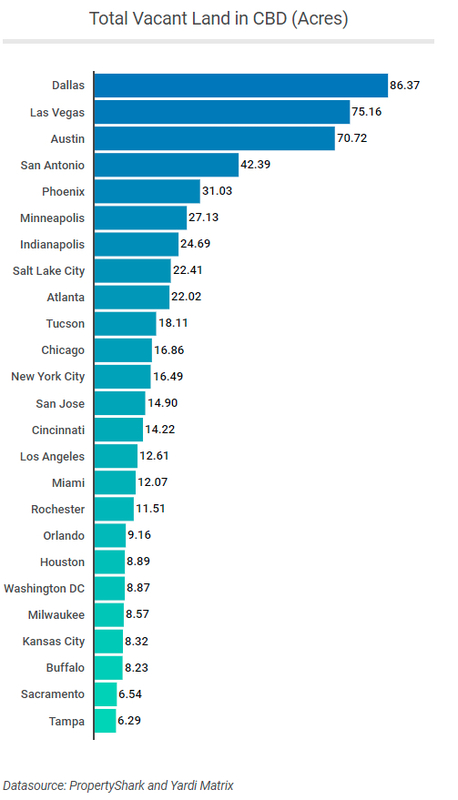 Rochester, buffalo, Houston, Tampa, etc....less available space than nyc and Chicago. I have been to all theses cities, this report is highly questionable. Jbarn wrote: I wonder where all that empty acreage is in New York City. I have rarely ever seen an empty space there. Rochester, buffalo, Houston, Tampa, etc....less available space than nyc and Chicago. I have been to all theses cities, this report is highly questionable. The size of the “CBD” they’re using for NYC is probably more than 20x larger than the one they use for Tampa, etc. There’s a decent amount of empty space on the far west side, like near where Hudson Yards is being built. While this graphic is a little embarrassing for the city, I do know one place it will fit well... Amazon proposal. With all the heat they've been getting recently in regards to their impact on host city, and potential host cities... some drama-free develop-able land in a CBD is a good thing. Where's Seattle in the list? Somebody on Skyscraper Central made a set of map overlay images showing parking lots in major cities and NYC's was surprising in that there are way more surface parking lots than I would have ever expected. You see them, walking around the city, but I guess I didn't realize really how many there were. Did you ever get closer to finding out on the basis of that forecast? No. Pure fantasy, as far as I can tell. Hopes and dreams. I love this idea. SO glad someone found a modular solution to filling empty office spaces downtown with residents... I only wish they had come up with this sooner so that more of the office towers with tunnel connections could have this option. The tower in the article sounds like it might be Pacific Place (1910 Pacific) but this would be a great solution for 1700 Pacific. Oh wow! What an interesting idea, thanks for sharing! I'm really curious to see what these units are like. I remember hearing about these live-work centers in other major cities, it just didn't seem like something that would come to Dallas anytime soon, but I'm glad this company sounds like it found a way to make it happen. Like the article says, it can add more 24/7 activity to office buildings that normally aren't very active in the evenings and weekends. This type of thing appeals to me because of the potential amenities you can get from some of these office buildings. Although, I'm sure these will be very expensive. Interesting concept. Thanks for the post. I'm curious how they get the plumbing/electrical/sewer lines from the building's system to the pre-built boxes, without drilling through floors and such. Innovative way to eat away at the existing supply of office space in the CBD. Is work being done on the old Sol Irlandes building? I was downtown on Sunday, and realized how dead it felt not having this building and patio active there anymore. It's crazy that so many projects have been completed, but because they're not contiguous, downtown still doesn't feel as vibrant as it should be. mdg109 wrote: Is work being done on the old Sol Irlandes building? I was downtown on Sunday, and realized how dead it felt not having this building and patio active there anymore. It's crazy that so many projects have been completed, but because they're not contiguous, downtown still doesn't feel as vibrant as it should be. Rumor is Headington has the entire thing under contract pending completion of building improvements. Includes this building and the Woolworth building. I agree, though, I really hope this building doesn't sit empty for long, as it does add a bit of dead space Downtown. It also doesn't help that the giant eyeball area is sometimes enclosed for events. Yet the downtown streets can seem eerily empty at times. I don’t get it. Much better than before, but we have a long way to go. ^That's true. It's better than before, but with so many projects completed I would have thought there would be a pretty consistent level of street activity by now. The thing is there are still too many empty storefronts, construction zones or empty lots separating all the active spots downtown. Hopefully the completion of Mid Elm lofts and a new tenant at the old Sol Irlandes will help bring more life to EMC while the Discovery District and East Quarter get completed. I wonder where they came up with that 135,000 daytime CBD population number. According to this D Magazine article, in 2015 there were only 70,000 people working in the CBD. Article in D Magazine today about how Downtown has "arrived." I work Downtown and things have improved dramatically over the last few years, but there is still a long way to go. Lots of tiny cracked sidewalks with no trees, streets with potholes, entire blocks 0 retail, tons of parking lots, The Drever under construction, DART not being as efficient and enticing as it can be, etc. I think Downtown would be a lot better in general if developers just built 5-10 story buildings, and we all gave up this fantasy of being Hong Kong. When I see renderings of that Perot Tower I just roll my eyes. All those skyscrapers are half full right now, they're just too massive to be economically viable in a city as spread out as Dallas, and region as Dallas Fort Worth. Also, I am pro urban but cars are a reality here and the idea that everyone is going to uber or bike to work is a fantasy. Street parking should be deregulated so parking wouldn't be so cumbersome and we could rely less on garages. I am hopeful for Downtown, but I also am not unrealistic to the powers and draw of suburban design here. More and more I see more people driving downtown, and at a certain point you just get total gridlock as everyone is leaving work. Companies will just leave and go to some suburb further North if their employees have to spend 30 minutes just leaving downtown.